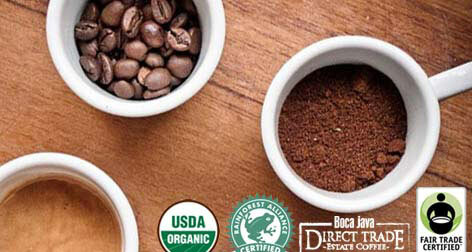 At Boca Java, we believe in sourcing only the very best coffees and doing it the right way - from seed to cup. We are committed to building mutually beneficial relationships with all of our farmers around the world. And that's why Boca Java is committed to sourcing and roasting certified coffees that make a difference in the lives of the people who bring us these amazing coffees. Here you will find USDA Certified Organic Coffee, Direct Trade Certified Coffees, Rainforest Alliance Coffee and Fair Trade Certified Coffees.